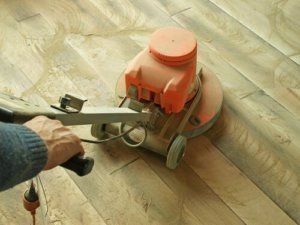 Most home remodelers will agree: no other home remodeling project will do more to boost the value and beauty of your home than refinishing your hardwood floors. Refinishing your hardwoods is a quick, easy way to give your floors a facelift. However, if your current floors are bulging or warped, a refinish is not going to be enough. If this is the case, then replacing your current floors will be necessary. How Many Times Can I Refinish? To maintain a healthy floor, keep your refinishing to a minimum. Before you begin, remove a register vent to see how much hardwood flooring is left. Once you’ve determined there is a reasonable amount of wood available, start planning your project. Refinishing hardwood can be a time-consuming, incredibly detailed process. If you’re not experienced in this area, we advise that you leave it to the pros. Experienced professionals have top-notch equipment, more experience and additional resources that are not always available to the average homeowner. If you are thinking about a home remodel, our team of Republic West Remodeling luxury remodeling contractors in Phoenix can help you develop a specific plan, based on our many years of remodeling some of the finest homes in Phoenix and Scottsdale.